This object, originally designated 1999 VH22, was named after the City of Las Cruces, New Mexico. Discovered 1999 Nov. 13 by David S. Dixon and Janet A. Stevens at Jornada Observatory, Las Cruces, NM, USA. 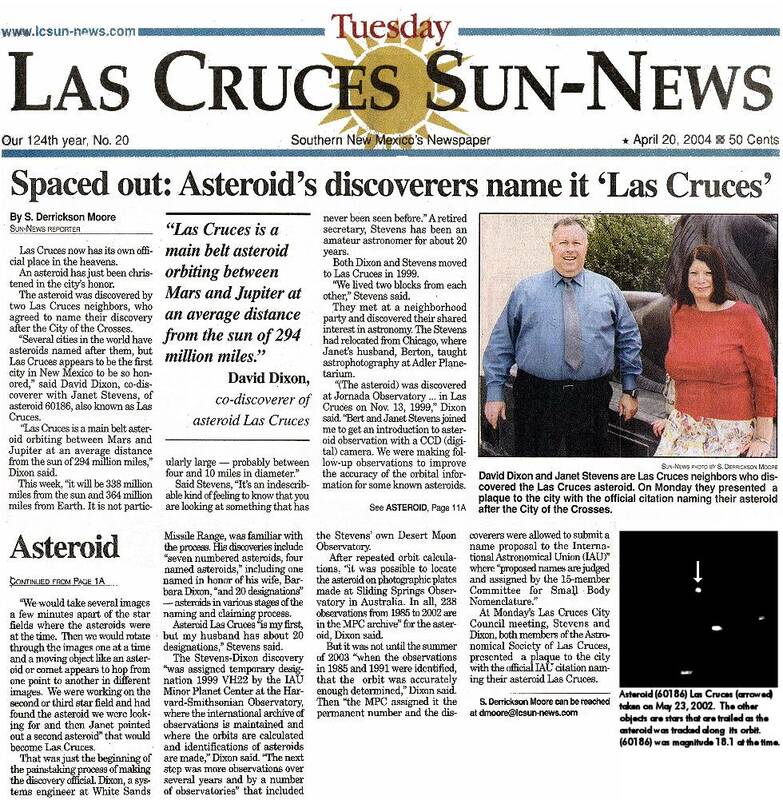 The citation for this minor planet reads as follows: "Las Cruces was founded in 1848 at a site along the Rio Grande river and has grown from a small settlement of about 120 persons to a city that is home to agriculture, industry and New Mexico State University. The clear, dry climate and elevation has attracted a number of astronomical observatories to the area." The Astronomical Society of Las Cruces procured a plaque commemorating the naming of the (60186) for the City of Las Cruces. The Las Cruces Sun-News printed a page one article (below the fold). The article can be found here. You can get an ephemeris (predicted positions) for this minor planet from the Minor Planet Center at the Smithsonian Astrophysical Observatory in Cambridge, MA. It really is a rather technical table of positions in Right Ascension (R.A.) which is like longitude in the sky and Declination (Dec.) which is like latittude. Just click the "Get Ephemerides/orbits" button below. If you want, there are more technical options below if you want to play with them. A PDF document describing the use of the MPES (Minor Planet Ephemeris Service) is available. Show residuals blocks. The observations from Jornada Observatory are indicated by "715" while Desert Moon Observatory observations are indicated by "448" You can limit the residuals to one observatory by entering the observatory code . Return to the Desert Moon Observatory Home Page.